How about an easy and quick side dish that will go well with anything and requires very little preparation? Sounds good right?! I don’t think I’m the only one to say that preparing a side dish after you have spent an endless amount of time in the kitchen preparing the main dish is kind of a drag, especially when you have no idea what to make. My favorite side dishes are the ones that require only very few ingredients, some salt and pepper, maybe a little healthy cooking fat and then into the oven to cook, giving me some time to relax! This dish is nothing short of my favorite type of Paleo side dish to prepare. It’s best to make when cauliflower is in season and one head of it is more than enough to feed a small group of people. You’ll also want to make sure pomegranates are available, because it may not be the main ingredient, but in my mind it’s what makes this dish so special, mainly because with every bite of otherwise somewhat bland cauliflower, you get a burst of something sweet and juicy! Perhaps you can tell that I find cauliflower a little boring? I find it very hard to get much flavor out of it, so when I make it, there is always some kind of powerful punch in the mix. The pomegranate seeds certainly work wonders, but the mint also help produce a very distinctive flavor for this dish. Other than being delicious and simple to prepare, this side dish is also a great source of vitamin C and as well as other powerful antioxidants. Both cauliflower and pomegranates are a great source of vitamin C and pomegranates are also know to contain an array of phytochemicals that act as antioxidants. Even though the holiday season is usually not the season when fresh vegetables like cauliflower are in season, this side dish is perfect for the festive period of the year because of the colors it features. 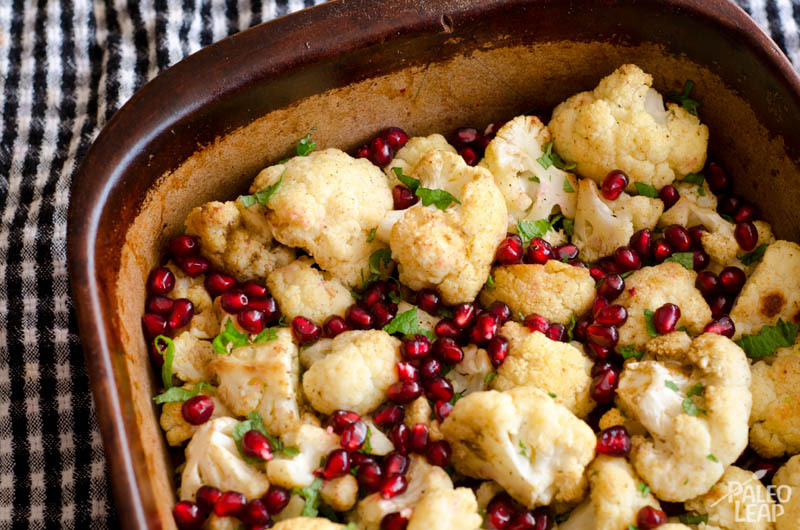 Bright red from the pomegranate seeds, green from the fresh mint and white from the cauliflower all contribute to give this dish a very festive look. 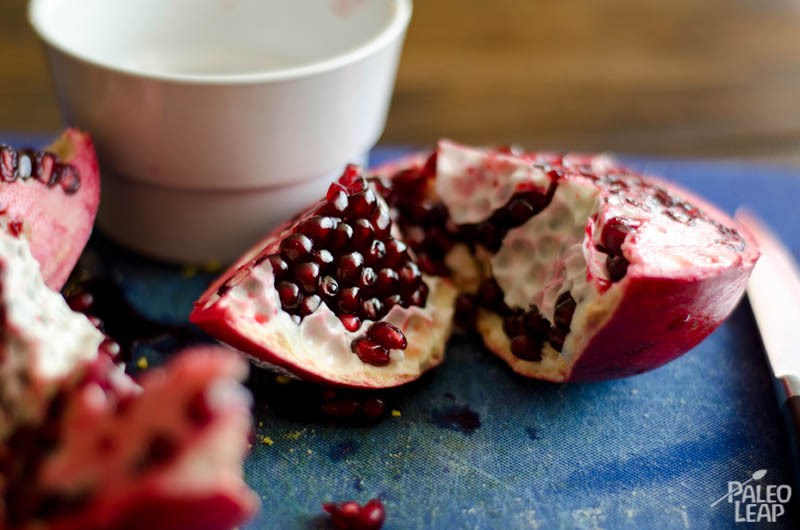 Cutting open and de-seeding a pomegranate can be a little tricky so here are a few pointers. First and foremost, pomegranate juice stains, a lot. Make sure to wear clothes that you won’t miss if they get stained by the juice. Wooden cutting boards can sometimes get stained by the juice too. In that case, you can use some lemon juice to remove the stain, but the goal is to cut open the pomegranate without releasing the juice from the seeds, so if everything goes well you shouldn’t have to worry about your cutting board. You’ll be de-seeding the pomegranate in a bowl filled with water so you can also cut it over that same bowl if you want. Starting from the crown, cut the pomegranate in half almost all the way through, then cut it in the other direction also almost all the way through, in order to make four quarters that you can now be pried open with your hands. You can now plunge the four quarters in the bowl filled with water and use your hand to remove the seeds from the white membrane that coats them. Once all the seeds are free from the membrane, you can skin off that membrane and then drain the water to keep only the seeds. Start by cutting up your cauliflower into bite-sized florets. Throw the florets into a large baking dish and toss them in the oil, cumin, salt and pepper. Make sure you really mix the ingredients well, as I did not take enough care in doing this and was left with some cauliflower completed coated in cumin, while the majority of it was not. Place the cauliflower in the oven and bake for about 30 minutes. Perhaps interrupt its cooking once or twice and give it a good stir so that you avoid any overcooked spots. You may notice that after 25 minutes they are beginning to golden and are tender to the touch. If so, remove them then, otherwise continue cooking until you reach this point. Once the cauliflower has roasted, remove it from the oven. Immediately transfer it into serving dishes and top with mint and plenty of pomegranate seeds. And that’s about it, ready to serve in no time! Enjoy!